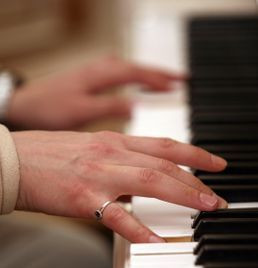 First the good news: The piano is the easiest instrument to play. Now the bad news: The piano is the easiest instrument to play unmusically. Each K-12 student has 31 lessons and 8 piano holidays scheduled during the 9 month school year. Please note: Holiday dates occasionally need to change. This listing was last updated on 10/5/2018. There are NO Lessons for K-12 Students on dates listed below their regular lesson day. 60 min. lessons =$200 / Month Total cost of 31 lessons during the school year will be billed in 9 equal monthly amounts. Payment is due in full by or on the first lesson of each month. New music will be billed as needed. No refunds of tuition /fees will be given if the student withdraws from lessons and leaves the studio. for more information on Summer Lessons for Kids & Teens, Missed & Cancelled Lessons, Billing & Payments, plus other Studio Policies. Always contact Sharon if you have any comments, questions or concerns. Her goal is a response to all messages within 2 business days. Sharon loves hearing from her Piano Families!